Stars And Garters: Friday Night Fights: Mosquito - Round 8: Fists Of Plasma! Heh. You picked this just for me! 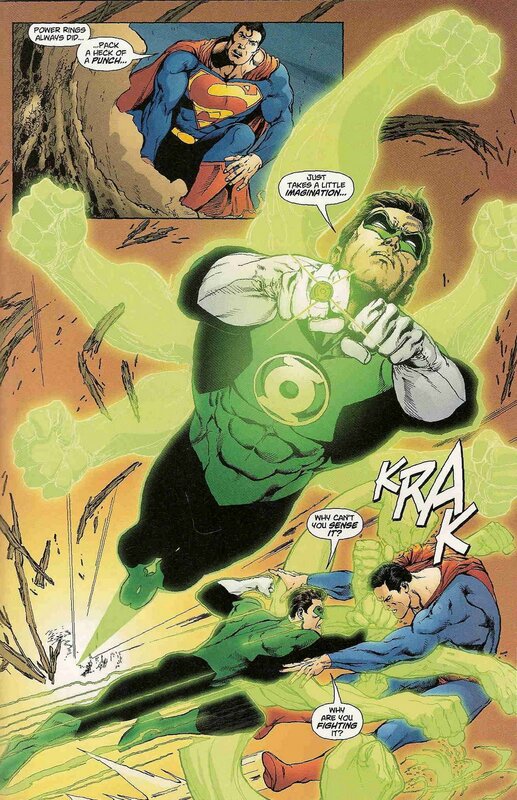 I get the feeling sometimes that Superman AND Batman tend to take Green Lantern powers for granted sometimes...because the various Lanterns do exercise restraint, and because Hal can be such an idiot sometimes. But when they AREN'T being restrained...look out! Remember when Kyle contained a Super Nova explosion, mainly because he didn't know that such a thing was theoretically impossible? Or when John took out Superman by going for his eyes? Or when Guy took out an Eclipso-possessed Superman, by flying to the sun, and dousing him with a vat of liquid Sunlight?